It is hard not to wonder just how great Monica Seles could have been were it not for the attack in Hamburg. Monica Seles, a former world No. 1 tennis player, released her memoir Getting A Grip: On My Body, My Mind, My Self on April 21, 2009. The autobiography details her bout with depression and her subsequent food addiction after being stabbed in a tennis tournament in Germany. It also describes dealing with her father’s cancer diagnosis and eventual death, which devastated a daughter who was very close to her dad. Finally it follows her journey back to the game and her aim for a life beyond tennis. Later on July 11, 2009, Seles was inducted into the International Tennis Hall of Fame, drawing attention to her story by a generation of tennis fans who may have missed her extraordinary rise to the top of the women’s game in the ’90s. Monica Seles was born in Novi Sad, Yugoslavia on Dec. 2, 1973 but she became a naturalized citizen of the United States in 1994. She started playing tennis when she was five years of age. 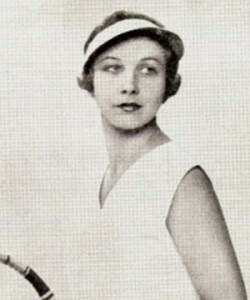 Her father, Karoly Seles, coached her and was the one who helped her develop her unique two-handed style with both the forehand and the backhand. He also contrived special moments that made the day-to-day practices fun for the little girl. Always keeping her eye on the prize, Chris Evert won at least one major for 13 straight years. As half of one of the greatest sports rivalries of all time, Chris Evert is probably the “half” less appreciated today. Her battles with Martina Navratilova grew to legendary status as they met so often in the finals of majors. The fact that Navratilova’s career extended years beyond Evert’s is the reason the Czech-American is better known today. 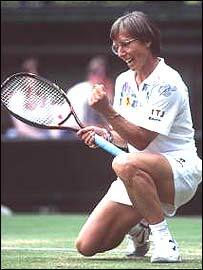 Evert was a powerful baseline player and Navratilova had the ultimate serve and volley game. They battled during an era when these two playing styles clashed on tennis courts around the world. But there was something else different between these two champions—their on court demeanor and individual personalities were as opposite as night and day. The one thing they did share in common was an ultimate drive and a fervent determination to be the No. 1 tennis player in the world. 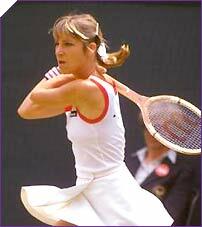 Seven of Steffi Graf's 22 career Grand Slam titles came at Wimbledon. “Will you marry me?” someone called from the stands. “How much money do you have?” was Steffi’s gravely delivered response, eyes fixed upon her opponent across the net. The crowd erupted in laughter. It was Wimbledon, and a crowd, and player, not given to much jocularity. She’d been dating race car driver, Michael Bartels, for years, with no indication that anything more serious was coming out of it. It was an impertinent question, an improbable response, and so hugely funny at the time. For me as a casual spectator (watching it on TV, from the horizontal position on the couch, no less), it was the first indication that the serious, un-smiling, un-’gamine,’ Steffi Graf might be interested in more than crushing opponents with hard-core resolve; be more than merely stoic in demeanor. Stefanie Marie Graf. Born June 14, 1969. One of a few well-beloved living legends of this, or any, sport. Arguably the greatest woman’s champion of all time. She turned pro at age 13, at age 19 she completed one of the feats of all sports, a Golden Slam – a calendar year Grand Slam of tennis majors and an Olympic Gold medal (1988 – Sydney), that is only a part of her legend. She retired in 1999, after almost 17 years in the sport, with a total of 22 major titles, second only in history to Margaret Court’s astounding 24. What distinguished her (see summary at the end of the article), was ability on all surfaces. Some tennis players are grass court specialists (with a minor on hardcourts), for example. Not Steffi. She had terrific ability on all surfaces.